LOL! Obviously, I forgot to mention the part about letting it grow out a bit before the test. Shaving your head and using Nair throughout your body is BAD advice. go in with a shaved head and they will take the hair from other places, but go in with NO hair and hou get a "refused/failed DOT drug test" on your record which you do not want. My apologies to you and Errol, G-Town. I got another job and it's been quite a while since I visited the forum. I actually did train with Swift. During the academy it was a bit of a cattle call. They had one instructor watching 20 or so drivers practicing their backing. A few months after I graduated, an instructor was killed during a backing accident in Texas. My mentor was an O/O who had a dedicated run from Columbus, Ohio to the Chicago area. His loads were never more than 30,000 pounds, so I received no experience scaling loads or sliding the tandems. That run also had few hills, let alone mountains, so I didn't gain any experience in that area, either. My first solo trip, I got a heavy load from Vermont to Seattle, WA. FUN! The training experiences aside, after I had been on the road about six months or so, I was dispatched on a load and the notes said, "IGNORE NO TRUCK SIGN." That seemed odd to me, so I took a photo of the message 'just in case.' Naturally, I got pulled over and was cited. Not long thereafter, I was called into my home terminal and they took me into an office, closed the door, and informed me they were going to have to let me go because of the incident. I asked why they decided to fire me over something they had told me to do, and produced the photo. Paperwork was signed, and I went out and began cleaning out my truck. About 15 minutes later, they called me back in and told me the terminal manager had decided to retain me. Swift actually paid for the ticket, but there were a lot of hoops to jump through, and I had to appear in court in Michigan, paid for my transportation, and lost income because of the time off the road. After that, my miles were greatly reduced, and it seemed like they were looking for an excuse to fire me. I could go into a lot more detail about my Swift experiences, but I think this is enough for you to get the idea why I might not be a big fan of the company. Jason, a year ago you asked Errol what he thought of Swift because you were looking to jump ship from a company you had trained with. I think an explanation is in order about the comment you made. OK, Jason, can you explain? Just curious. And as of January 1, Swift uses hair testing. This may not be the right forum for this, but it's related to the topic, so I thought I'd go ahead and give it a whirl. About 2 1/2 years ago I tested positive for marijuana on a non-DOT pre-employment drug test. When I arrived at the trucking company to begin my training, the security officer made a group announcement that such test results would come back on the background check, so we were advised to divulge the information. I struggled with the decision of whether or not to say anything. On the one hand, I needed and wanted the job badly, but on the other, I didn't want to risk waiting until I was obligated to repay the cost of training if they discovered it. To make a long story short, I told them about the test and was booted from training. I decided to change my habits for health reasons, and now I'm completely clean and sober. I would be happy to provide the hair follicle sample if I can find a company that would train me given my prior test result. The company guy told me that there is a 7 year DOT-mandated waiting period following a positive test result, but then I've heard conflicting time frames from recruiters at other companies who have told me this is a company-by-company policy, so I'm not sure what information is correct. If anyone knows the answer, I would appreciate it. Also, does anyone know of any of the companies that train that would take me on given my history? Thanks! Can anyone verify Prime's testing? I just went through their medical evaluation, and I can say for certain it's UA only. I hope that helps someone out there who's considering Prime. Sorry to hijack the thread, but I'm putting in an application with Prime right now. Anyone want me to list them as a referral? I'm assuming there may be some kind of incentive involved. Because of my weight, I'm assuming I'll have to do the sleep study to be tested for apnea. I'm fairly sure that I don't have it, because I was tested about 2-3 years ago and was fine, but if I do, what kind of hassles will I encounter? Anyone know about Southern Refrigerated Transport? Thanks very much, Red. Called SRT and spoke with a recruiter who just told me they do UA only. Hope that helps. How about SWIFT or CRST? Thanks for the quick replies. Any word on Millis Transfer? They're currently at the top of my list. 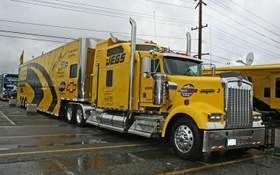 If no one knows about the current testing at Millis, how about Henderson Trucking? I met one of their drivers during a bit of down time at a Greyhound station who says they are a good company to work for. I am considering changing careers and getting into truck driving. As I have used drugs in the past, I would like to know which companies out there use ONLY the urine test. Thanks!